EuroPython 2015: Educational Summit, DSF Diversity Statement, baldr and much more. Lots of articles/projects shared with us this week! Keep them coming, we love seeing what everyone is working on. Enjoy and have a great weekend! 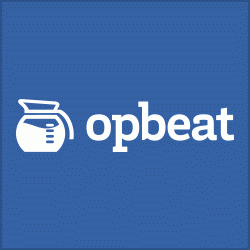 When an error occurs, Opbeat deduces who the best equipped person to fix the code is via Git. Receive fewer but smarter notifications & spend more time being productive. Read the full article. Django Webtest author Mikhail Korobov is looking for maintainers to help take over maintenance of the project. As per PEP8 "Explicit is better than implicit", you can check out the complete diversity statement here. The educational summit at EuroPython 2015 has been announced. This is being organized together with the Raspberry Pi Foundation. Click through for all the details. A library and tool for generating .pex (Python EXecutable) files! Pretty cool tool, allows you to produce CSS Gradients as placeholders for images. A Python decorator that helps ensure that a Python Process is running only once. A Flask web app to seamlessly create sqlalchemy models by dragging/dropping objects in a canvas. An open source flight simulator for aerial drones written entirely in Python. A python module for Bayesian statistical modeling and model fitting which focuses on advanced Markov chain Monte Carlo fitting algorithms. Sparkit-learn aims to provide scikit-learn functionality and API on PySpark. The main goal of the library is to create an API that stays close to sklearns'. Pretty interesting read on proposed change to Django Request-Response cycle. Looking at the Travelling Salesman Problem where the salesman visits Tesla superchargers. YAPWFB, I know what you are thinking what is Falcon? Nice introduction on how to use pandas categoricals for improved speeds. Dealing with timezones can be a nightmare, here are some problems you often encounter and recommendations for dealing with them in your Python application. Here is why using sys.setdefaultencoding() in your programs should be avoided. Part 1 of a pretty useful general look at testing Python applications that use Requests, without using the internet. Interesting visualizations of Python projects at quantified code. Check them out! This is a case study presented as a tutorial. It will guide you through obtaining, cleaning, augmenting and visualizing a geospatial dataset. Follow these rules to improve your Python packages.